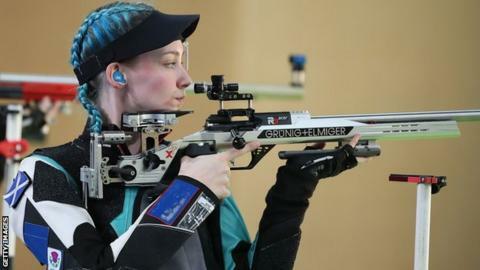 Great Britain's Seonaid McIntosh earned a Tokyo 2020 Olympic Games quota place after finishing fourth in the 50m rifle three positions finals at the World Championships in South Korea. McIntosh narrowly missed out on a third medal having won an individual gold and team bronze earlier on at the event. "The quota place is certainly going to make my final year at university a bit easier," said the 22-year-old Scot. On Friday, Aaron Heading and Kirsty Barr won a bronze in trap mixed pairs. But they missed out on a quota place, which was on offer to the top two finishers. Slovakia took gold and the British pair equalled Russia's 33 clays - but the silver went to the Russian pair because of their better record in qualifying. "We're absolutely over the moon with our bronze medal," world number one-ranked trap shooter Heading said. "Me and Kirsty pulled it out of the bag for Great Britain," he added. Both won silver medals at the Commonwealth Games earlier this year. How to get into shooting - choose between the three disciplines of pistol, rifle or shotgun and find your nearest club.